Example of simulation and visualization of the two-dimensional static magnetic potential field around a u-shaped permanent magnet. This model is available as an automated tutorial by selecting Model Examples and Tutorials... > Electromagnetics > Magnetic Field Around a Permanent Magnet from the File menu. Or alternatively, follow the step-by-step instructions below. 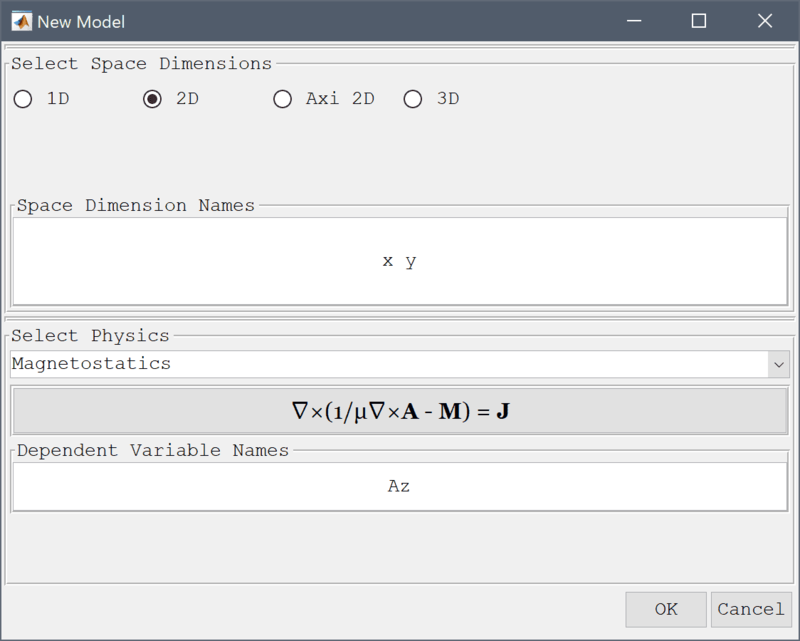 Select the Magnetostatics physics mode from the Select Physics drop-down menu. 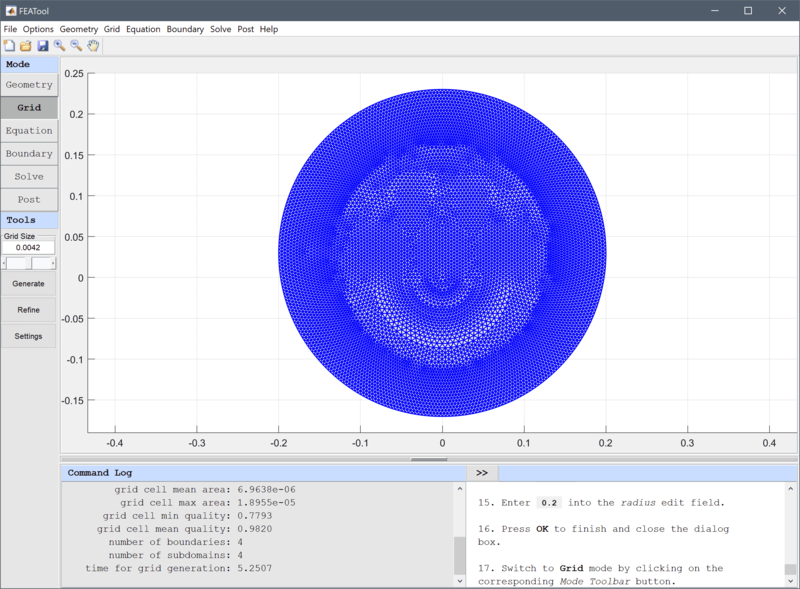 Start by creating two circles centered at (0, 0) and with radius 0.05, and 0.0025, respectively. Enter 0.05 into the radius edit field. Enter 0.025 into the radius edit field. Subtract rectangle R1 and the smaller circle C2 from C1 using the formula C1 - C2 - R1 in the Combine Objects... option of the Geometry menu. 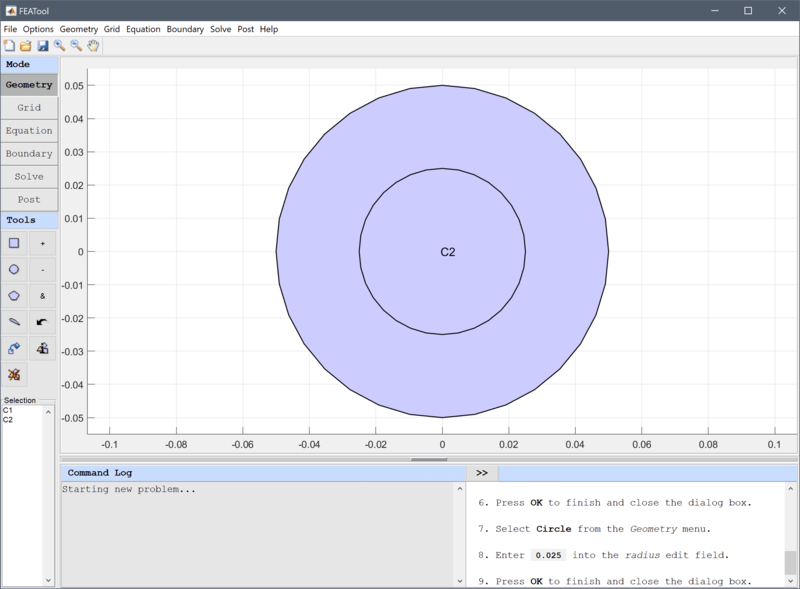 Lastly, create a larger circle for the surrounding domain. Enter 0 0.03 into the center edit field. Enter 0.2 into the radius edit field. Press the Equation mode button to switch from grid mode to physics and equation/subdomain specification mode. 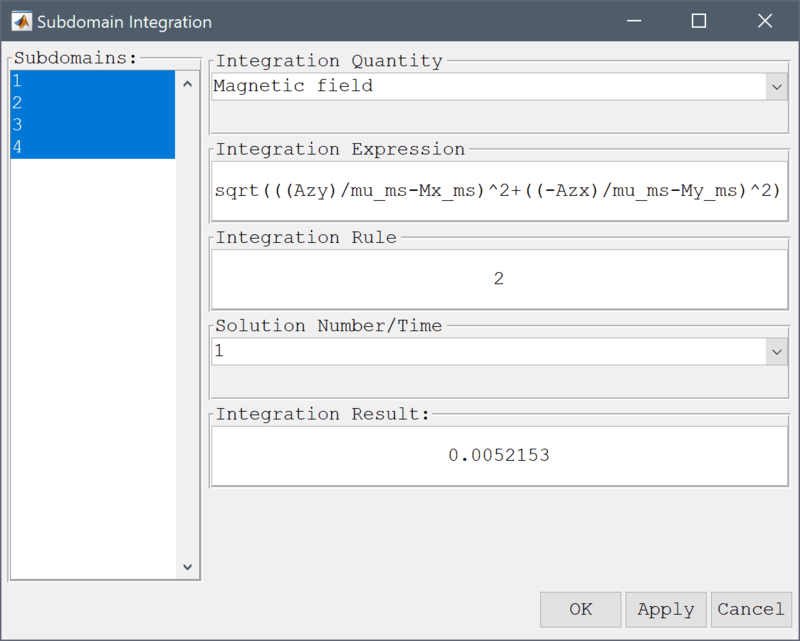 In the Equation Settings dialog box that automatically opens, prescribe opposing magnetization of the magnet ends by setting the Magnetization, My coefficient to 1 and -1 in subdomains 1 and 2, respectively. 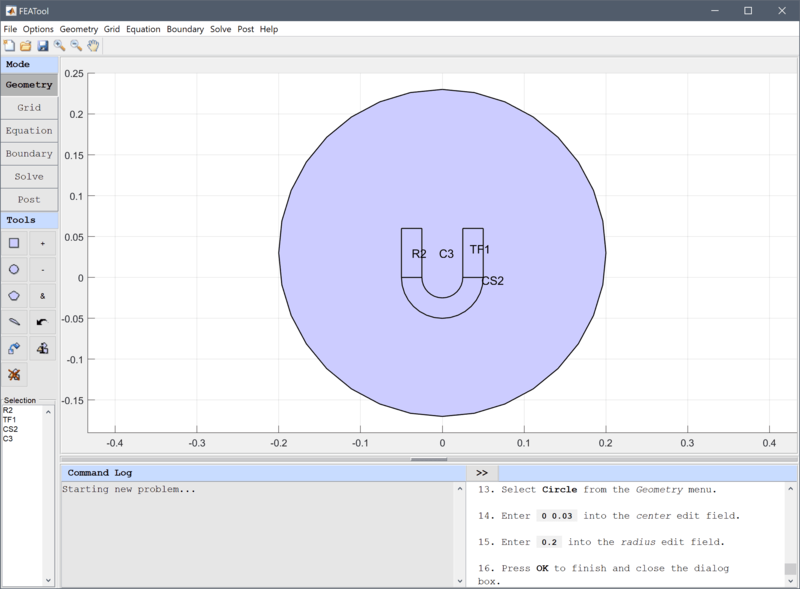 Leave the the magnet curve and outer domain with zero magnetization. In Boundary mode, set or leave all the boundary conditions to the default Magnetic insulation/antisymmetry selection. 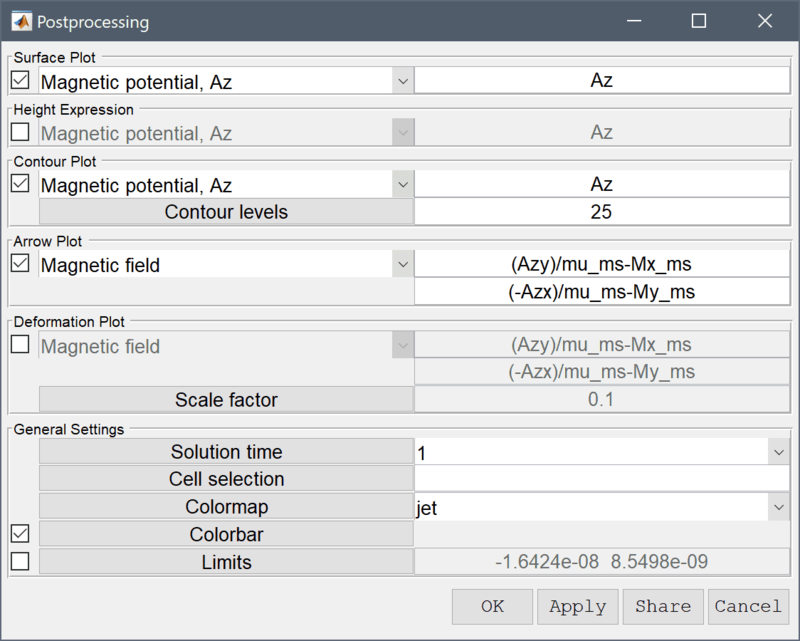 After the problem has been solved, FEATool automatically changes to Postprocessing mode and plots the Magnetic potential, Az. 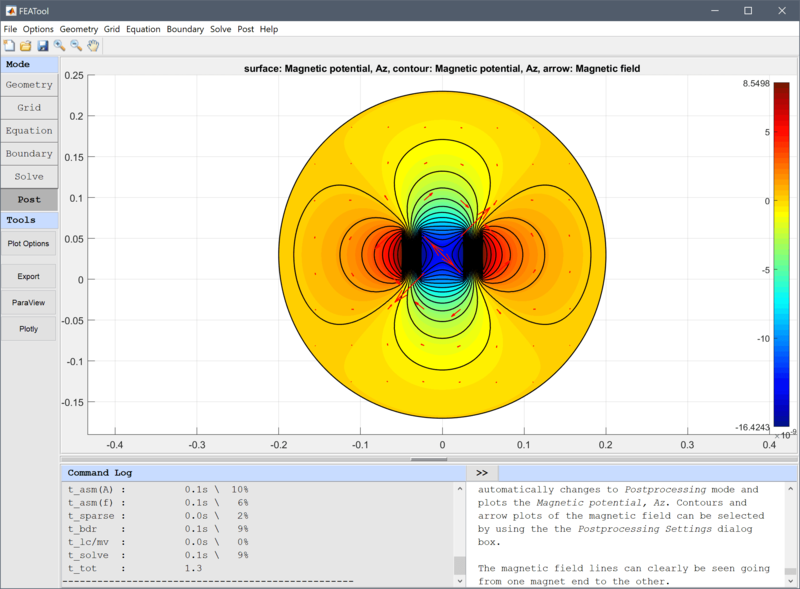 Contours and arrow plots of the magnetic field can be selected by using the the Postprocessing Settings dialog box. The magnetic field lines can clearly be seen going from one magnet end to the other. 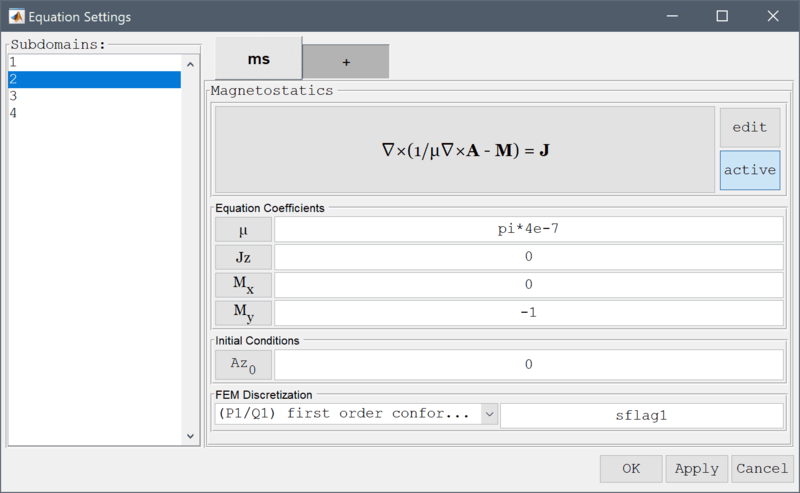 To verify the solution, choose the Subdomain Integration... option in the Post menu, and integrate the Magnetic potential, Az and Magnetic field over all subdomains, the integrals should result in values around -7.1e-11 and 0.005, respectively. The magnetic field around a permanent magnet electromagnetics model has now been completed and can be saved as a binary (.fea) model file, or exported as a programmable MATLAB m-script text file, or GUI script (.fes) file.